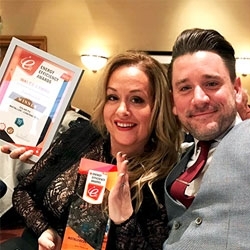 Swansea, United Kingdom, April 04, 2019 --(PR.com)-- A family-run solar panel installation company from South Wales has been voted Solar PV installer of the Year 2019 at the Welsh Energy Efficiency Awards, for the third time running. Solar Plants, an innovative company from Port Talbot, supply solar and other renewable energy systems to homeowners throughout the UK. And despite government cuts to solar incentives, Solar Plants has continued its fast growth by spearheading new and innovative energy generating and battery products that can save the average homeowner thousands on their energy bills. Solar Plants Managing Director, Oliver Farr, says, “It was a great honour to represent our industry at the these regional awards. Solar with storage represents the future of energy supply, providing security against the uncertainty of energy prices and is an environmentally friendly way of producing power. The ceremony was held in Cardiff City Centre’s Marriott Hotel, bringing together industry leaders dedicated to alternative and renewable sources of energy. The National Energy Efficiency Awards were launched in July 2015 following the changes in Government Energy Efficiency Policy. Previously known as the Green Deal & ECO Awards, these awards were set up in 2014 to help motivate the energy efficiency sector in their delivery of the Green Deal Finance Initiative and Energy Company Obligation Scheme. The Energy Efficiency measures introduced by the Government following the Energy Act 2013, included the Energy Company Obligations (ECO) Scheme, the Green Deal Finance Initiative, and the Renewable Heat Incentive (RHI). These measures together help homeowners reduce their energy bills, tackle fuel poverty and reduce Carbon emissions. The aim of the Energy Efficiency Awards is to provide public recognition for the excellent work the Energy Efficiency sector is doing in implementing these, and other, energy efficiency schemes. And to help encourage best practice within the Energy Industry as it, works to improve UK housing stock. Visit our Solar PV page to learn more about us.